RMCS offers a fun and stimulating program to meet the needs of the young child and Kindergarten-aged student! 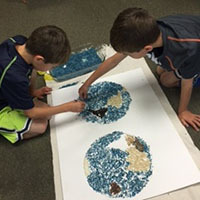 As with all Montessori levels, this program would typically be a multi-aged classroom, including ages 3-6, with the last year as an invaluable, capstone Kindergarten year. As a public school, we are able to offer two years of this program for children aged 4 ½ through 6. Transitional Kindergarten is the first of a two-year Kindergarten program that allows children to have access to an extra year of schooling if their birthday falls between September 2 and December 2. At RMCS, our students develop themselves in all areas of development—cognitively, socially, physically, and emotionally—as they work on independence, competence, and confidence in a fun, peaceful, interactive, and stimulating academic and social learning environment. 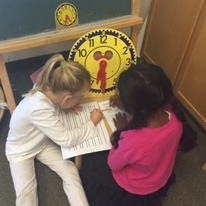 Kindergarten is a very important year for the Montessori child! Our students are the venerated leaders of this level, demonstrating great skills and accomplishments in academics while enjoying the social interactions so important to this age. Guiding others inspires their own great academic achievement and helps to develop a meaningful sense of pride in their accomplishments, abilities, and who they are as people. Click on this TK/K Supply Donation List and simply go to the local office supply stores to pick up your supply donations, or order through the AmazonSmile* program.